In April to June 2014 I was involved in devising and performing as an actor musician in Day of the Living as part of the Royal Shakespeare Company Mischief Festival at the Other Place. This was devised production directed by Amy Draper with music and lyrics by Darren Clark and script by Juliet Gilkes Romero. Eilon Morris masked as Manolo in Day of the Living 2018. 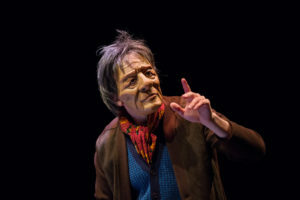 Photo by Ellie Merridale © RSC.